Audit Managers apart from overseeing the audit team ensure that the audit investigation is as carried out as per the Company’s and Government’s standards. 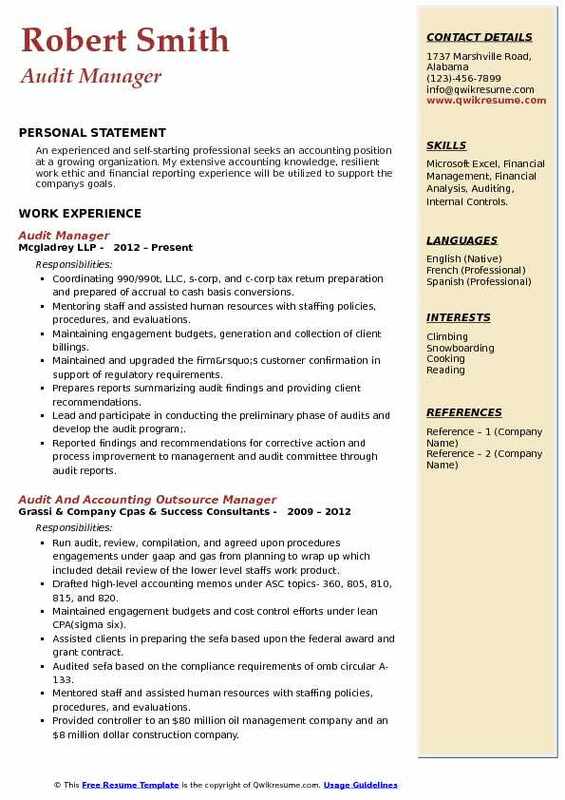 A well-crafted Audit Manager Resume focuses on job duties like providing direction to the auditing team, leading the team in the investigation, drafting reports and summarizing the findings, reporting the finding to the higher officials and identifying potential risks. The audit managers are also involved in producing detailed reports, supervising and developing the junior team, ensuring compliance with internal audit requirements and recommending risk aversions. 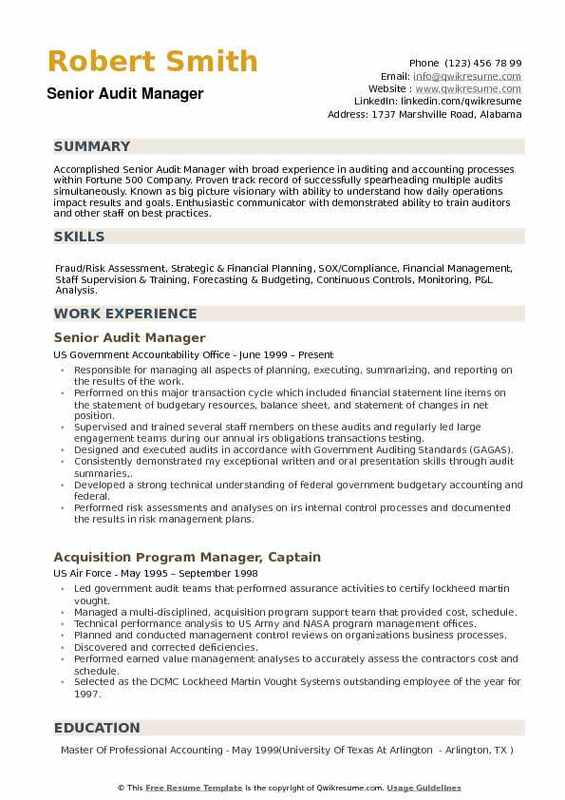 Audit Managers are expected to possess a high level of analytical knowledge and show advanced computer skills in accounting and audit software or database, these professionals are also expected to possess proven experience in maintaining audit standards, laws and regulations. A Bachelor’s degree in the field of Accounting or finance is found commonly amongst applicant’s resume, some employers prefer a Master’s degree. 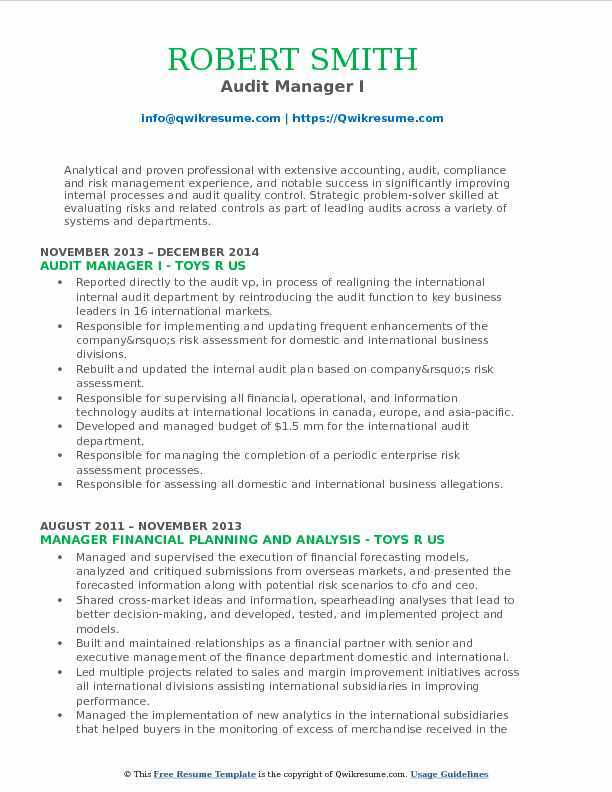 Summary : Accomplished Audit Manager, with a track record of successfully managing all stages of financial audits. Result oriented, dependable professional experience in, non profit, and community redevelopment agencies. Excels in fast-paced environments with minimal supervision and often exceeds expectations. Specialize in increasing productivity and company profitability. Work well independently and as part of a team. Manage a group of auditors to ensure the accuracy of gaming financial records. Coordinate audits of internal CNOGC operations, including the commissioners game approval files, the inspectors files including testing results for software and lab reports to ensure accuracy,. Proper approvals and documentation such as lab reports, software testing results and requests are included in the files. Audits, Reviews/analyzes data and submits findings and proposed solutions. Review audits, conducted by the Chickasaw Nation Department of the treasury and the performance. Review the commissioners Standard Operating Procedures for internal departments including background and licensing, which includes gaming vendors and gaming employees to ensure procedures are in place to comply with federal, state and tribal regulations. Review and make recommendations for Standard Operating Procedures to comply with the regulatory requirements for promotions, game approvals and the gaming inspectors process and procedures. Summary : CPA with an entrepreneurial focus with extensive experience planning and performing assurance and attestation engagements including financial reporting, risk advisory services, client training and consulting. Strong background in assisting clients with compliance with regulations and the effective design, documentation and implementation of internal controls. Effective verbal and written communicator with extensive experience in concise presentation of ideas, recommendations and results. Conducted tests of key controls, communicated the results of the review, both orally and written as well as monitor management’s completion of agreed upon actions. Maintained process narratives documentation of global locations. Performed walkthroughs and documented key business processes in flowcharts and/ or narratives. Assisted external auditors (ey) to complete interim financial statements. Planned, executed, and led financial, operational and compliance audits of the company’s worldwide subsidiaries. Conducted risk assessments and identified controls in place to mitigate identified risks. Prepared timely audit reports for executive management, the audit committee and the board of directors. Tested key financial controls, monitored testing progress, confirmed key stakeholders are kept informed about progress and expected outcomes. Maintained process narratives documentation of company’s locations. Performed walkthroughs and documented key business processes in flowcharts and/ or narratives. Summary : Compliance Management / Project Management Resourceful, innovative professional with over 17 years Audit/Compliance, Financial, IT and Project Management experience primarily within the services industry. Expertise in initiating programs that boost efficiency and productivity while improving company compliance and mitigating risk. Manage client accounts including billing, fee analysis and new service development. Provided a valuable insight to improve the operational efficiency of a business unit, department, or individual process. Applied changes to the audit methodology which requires a separate addendum to the original written agreement. Prepare sections of the audit reports and document working papers. Strong follows up on all outstanding audit points. Apply and test key accounting principles and techniques during the planning and fieldwork. Review, analysis and make recommendations for improvements in financial accounting systems and controls in order to assist the client in preparing for future external audits. Plan and perform operational and financial audits to ensure that financial statements are fairly presented in accordance with gaap. 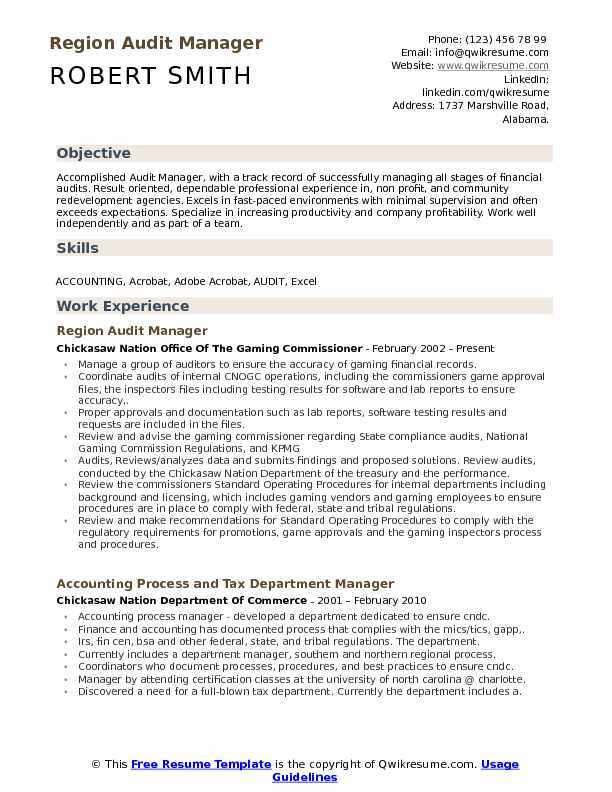 Summary : Dedicated Certified Public Accountant with 19 years experience in accounting and finance. 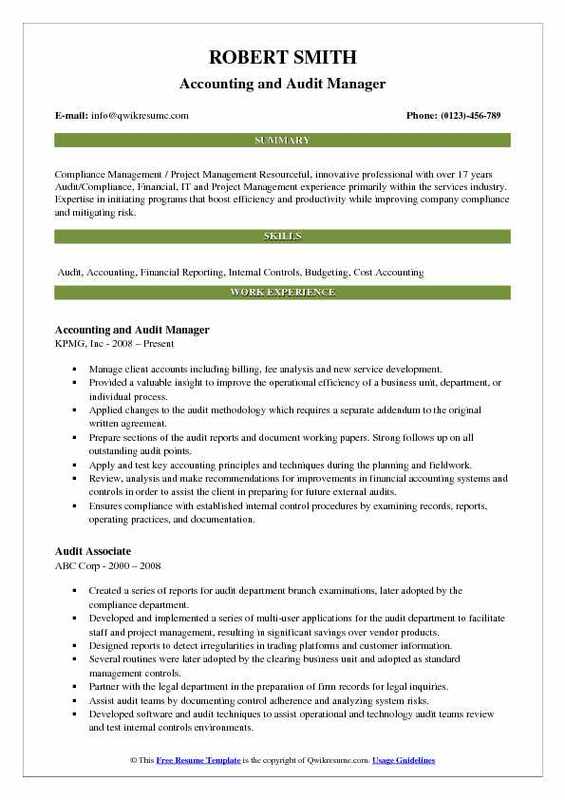 Audit Manager proficient in compliance risk assessment and resolution, as well as, financial analysis. 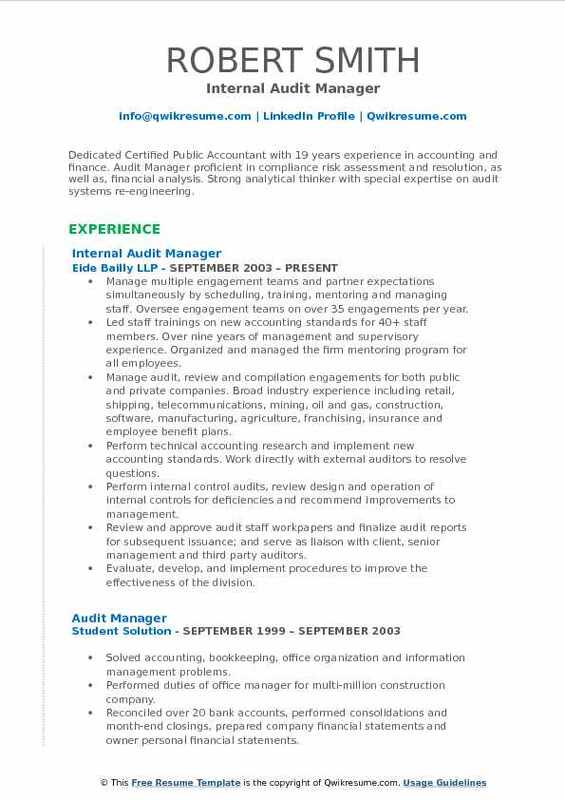 Strong analytical thinker with special expertise on audit systems re-engineering. Manage multiple engagement teams and partner expectations simultaneously by scheduling, training, mentoring and managing staff. Oversee engagement teams on over 35 engagements per year. Led staff trainings on new accounting standards for 40+ staff members. Over nine years of management and supervisory experience. Organized and managed the firm mentoring program for all employees. Manage audit, review and compilation engagements for both public and private companies. Broad industry experience including retail, shipping, telecommunications, mining, oil and gas, construction, software, manufacturing, agriculture, franchising, insurance and employee benefit plans. Perform technical accounting research and implement new accounting standards. Work directly with external auditors to resolve questions. Perform internal control audits, review design and operation of internal controls for deficiencies and recommend improvements to management. Review and approve audit staff workpapers and finalize audit reports for subsequent issuance; and serve as liaison with client, senior management and third party auditors. Evaluate, develop, and implement procedures to improve the effectiveness of the division. Summary : Energetic, versatile, and results-oriented internal auditor with 10 years experience in the field and the qualifications to support activities requiring strong communication, analytical, auditing, accounting, and problem solving abilities. Skilled at working independently and collaboratively in a demanding fast-paced environment to efficiently complete key tasks while meeting deadlines and exceeding performance expectations. Skills : Training, Financial Analysis, Auditing, Problem Solving, Staff Development, Leadership And Interpersonal Relations. Manage and directed seven (7) staff members to handle retention and reimbursement rates, loan success, and gain 100% customer satisfaction. Protect the organization against losses by reviewing and analyzing bank. Create and maintain a culture of risk-management by perpetual coaching, quality assurance monitoring, and skill development training. Schedule staffing to ensure workflow effectiveness, and correct inapt individual performances pursuant to 100% accuracy. Develop audit procedures to evaluate the effectiveness of established controls to improve customer care. Prevent fraudulent activity through a vigilant review of research, reports, financial statements and credit packages. Monitor credit risk exposure by developing and launching follow-up action plans. Review credit history and validate financial information for approval. Prepare and review monthly financial statements and annual company budget. Implement quality control measurements to ensure effective, efficient and professional customer. Comply with banks policies, procedures, all applicable federal and state laws and regulations. 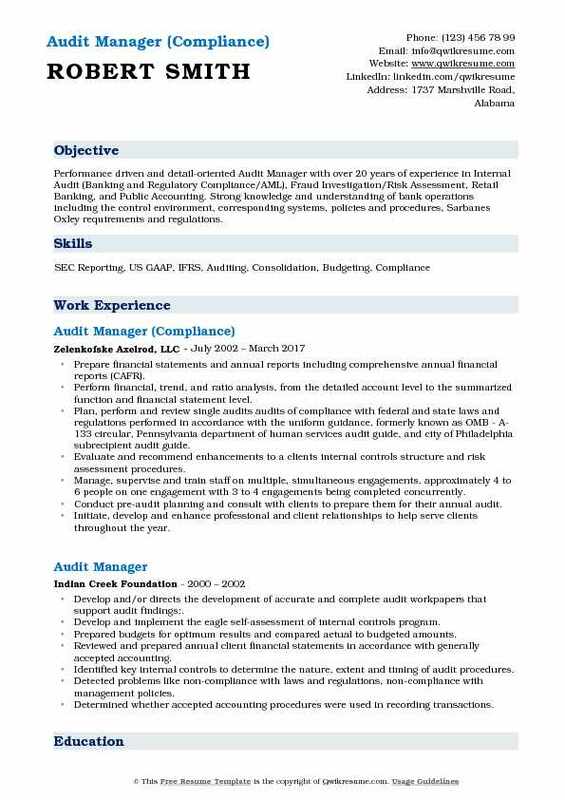 Summary : Performance driven and detail-oriented Audit Manager with over 20 years of experience in Internal Audit (Banking and Regulatory Compliance/AML), Fraud Investigation/Risk Assessment, Retail Banking, and Public Accounting. Strong knowledge and understanding of bank operations including the control environment, corresponding systems, policies and procedures, Sarbanes Oxley requirements and regulations. Prepare financial statements and annual reports including comprehensive annual financial reports (CAFR). Perform financial, trend, and ratio analysis, from the detailed account level to the summarized function and financial statement level. Plan, perform and review single audits: audits of compliance with federal and state laws and regulations performed in accordance with the uniform guidance, formerly known as OMB - A-133 circular, Pennsylvania department of human services audit guide, and city of Philadelphia subrecipient audit guide. Evaluate and recommend enhancements to a clients internal controls structure and risk assessment procedures. Manage, supervise and train staff on multiple, simultaneous engagements, approximately 4 to 6 people on one engagement with 3 to 4 engagements being completed concurrently. Conduct pre-audit planning and consult with clients to prepare them for their annual audit. Initiate, develop and enhance professional and client relationships to help serve clients throughout the year. Discuss with clients senior management and board of directors regarding the results of the audit and/or current accounting and compliance issues. Lead annual trainings on current not-for-profit accounting and auditing issues and risks. Objective : Analytical and proven professional with extensive accounting, audit, compliance and risk management experience, and notable success in significantly improving internal processes and audit quality control. Strategic problem-solver skilled at evaluating risks and related controls as part of leading audits across a variety of systems and departments. Reported directly to the audit vp, in process of realigning the international internal audit department by reintroducing the audit function to key business leaders in 16 international markets. Responsible for implementing and updating frequent enhancements of the company’s risk assessment for domestic and international business divisions. Rebuilt and updated the internal audit plan based on company’s risk assessment. Responsible for supervising all financial, operational, and information technology audits at international locations in canada, europe, and asia-pacific. Developed and managed budget of $1.5 mm for the international audit department. Responsible for managing the completion of a periodic enterprise risk assessment processes. Responsible for assessing all domestic and international business allegations. Partnered with third party vendor in the assessment, validation, and effectiveness of the sox internal controls in overseas operations. Engaged in routine dialogue with domestic and international senior management related to state of business units’ internal controls. Leader in projects related to reducing audit fees from the external auditors. Coordinated audit activities with external auditors ensuring proper audit coverage, eliminating duplicated efforts, and improved efficiency of audit activities. 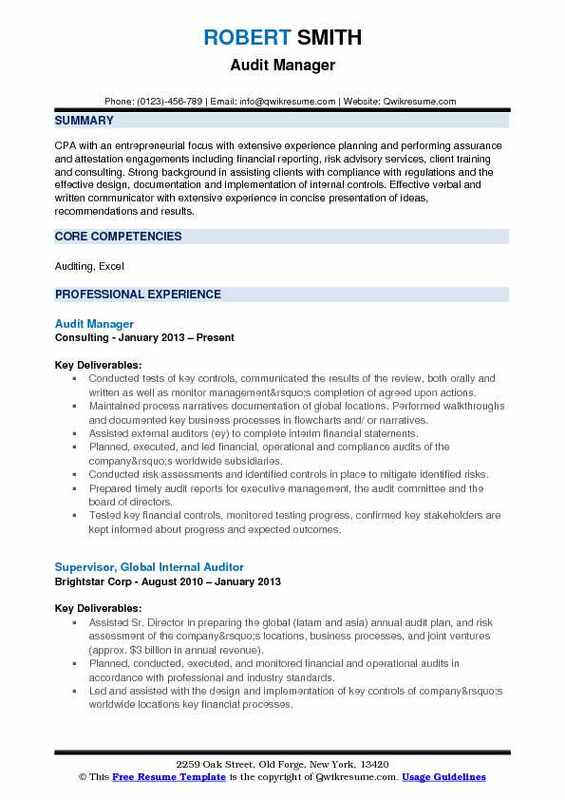 Summary : Highly qualified Audit Manager with over 18 years of experience working with clients in various industries with extensive knowledge of accounting and auditing standards. Recognized for the ability to identify problems and its solutions. Adaptable, responsive, reliable, team player, hardworking and service oriented. Ability to communicate clearly with colleagues and clients at all levels. Managed several teams in different assignments and implemented proper coordination within the teams and with the clients for timely delivery of assignments. Assessed risks associated with the entitys operations and financial reporting, identified weaknesses in internal controls and provided recommendations to address these risks and mitigate these deficiencies. Successfully managed to communicate proficiently findings and issues noted in the audit to the clients. Tailored substantive audit procedures that address the entitys specific risks. Modified audit plans and testing to be in line with the risk based audit approach, which improved the efficiency of the teams and increased organizational profitability. Prepared and ensured that the financial statements are in accordance with the International Financial Reporting Standards (IFRS) or generally accepted accounting principles (GAAP), along with applicable. Prepared consolidated financial statements for a group companies in accordance with applicable. 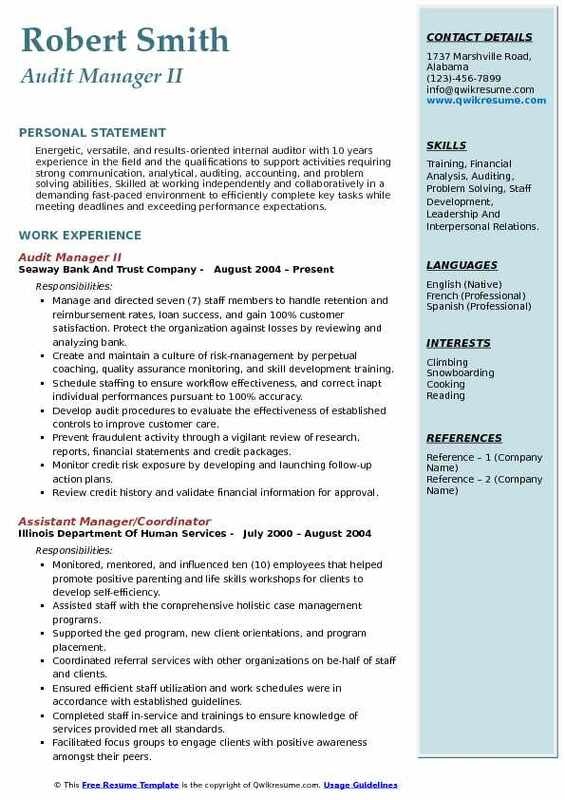 Summary : An experienced and self-starting professional seeks an accounting position at a growing organization. My extensive accounting knowledge, resilient work ethic and financial reporting experience will be utilized to support the companys goals. Skills : Microsoft Excel, Financial Management, Financial Analysis, Auditing, Internal Controls. Coordinating 990/990t, LLC, s-corp, and c-corp tax return preparation and prepared of accrual to cash basis conversions. Mentoring staff and assisted human resources with staffing policies, procedures, and evaluations. Maintaining engagement budgets, generation and collection of client billings. Maintained and upgraded the firm’s customer confirmation in support of regulatory requirements. Prepares reports summarizing audit findings and providing client recommendations. Lead and participate in conducting the preliminary phase of audits and develop the audit program;. Reported findings and recommendations for corrective action and process improvement to management and audit committee through audit reports. Conducted analytical procedures to determine reasonableness of financial reporting. Assisted the chief internal auditor and senior director in the planning and execution of audits across the corporation. 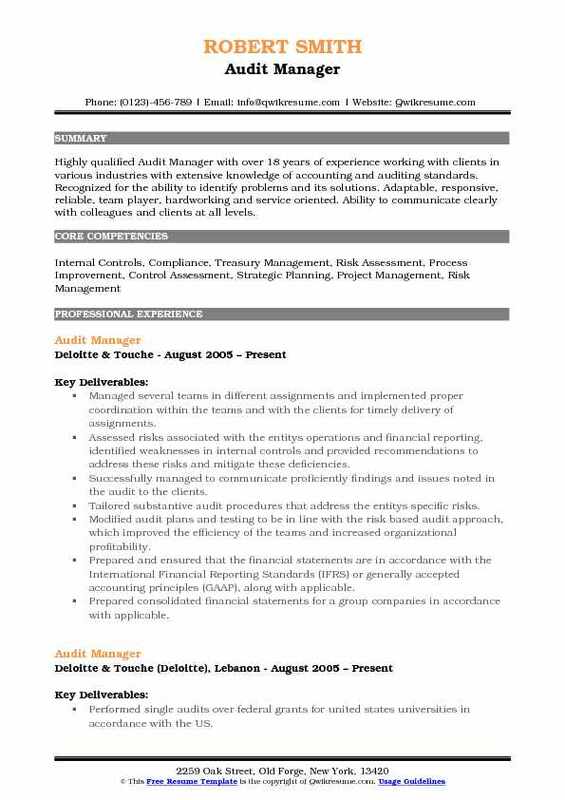 Summary : Accomplished Senior Audit Manager with broad experience in auditing and accounting processes within Fortune 500 Company. Proven track record of successfully spearheading multiple audits simultaneously. Known as big picture visionary with ability to understand how daily operations impact results and goals. Enthusiastic communicator with demonstrated ability to train auditors and other staff on best practices. Skills : Fraud/Risk Assessment, Strategic & Financial Planning, SOX/Compliance, Financial Management, Staff Supervision & Training, Forecasting & Budgeting, Continuous Controls, Monitoring, P&L Analysis. Responsible for managing all aspects of planning, executing, summarizing, and reporting on the results of the work. Performed on this major transaction cycle which included financial statement line items on the statement of budgetary resources, balance sheet, and statement of changes in net position. Supervised and trained several staff members on these audits and regularly led large engagement teams during our annual irs obligations transactions testing. Designed and executed audits in accordance with Government Auditing Standards (GAGAS). Consistently demonstrated my exceptional written and oral presentation skills through audit summaries,. Developed a strong technical understanding of federal government budgetary accounting and federal. Performed risk assessments and analyses on irs internal control processes and documented the results in risk management plans. Assessed the effectiveness of key irs internal controls and made recommendations for improvement.